Size of photos or images is increasing day by day. Cameras now-a-days support huge resolution and every new camera launch packs in more and more pixels (resolution) for the same price. Almost all the mobile devices support a camera. What is you get is lots and lots of images and you need to deal with their ever increasing size. Though storage costs now-a-days are dirt cheap, but still file size does matter when it comes to sharing and moving files from a computer or device to another. There are several solutions available, which can help you reduce the size of images. However, what you get by reducing the file size is compromise picture quality. Mac users can now rejoice – there is an app, which can reduce the size of photos without any compromise on the quality of the image. JPEGmini is a Mac app, which you can use to reduce the size of images. It even supports the new MacBook Pro with Retina display! JPEGMini is one of the Top 5 Photography Apps in the U.S, China, Japan, Russia, Brazil, Austria, Ireland, Turkey and many more countries. You put your photos on a diet with JPEGmini! JPEGmini reduces the file size of your photos by up to 5X, while keeping their original resolution, quality and JPEG format. With JPEGmini you can optimize all your photos to free up valuable hard drive space, and share full-resolution photos with your friends much faster. 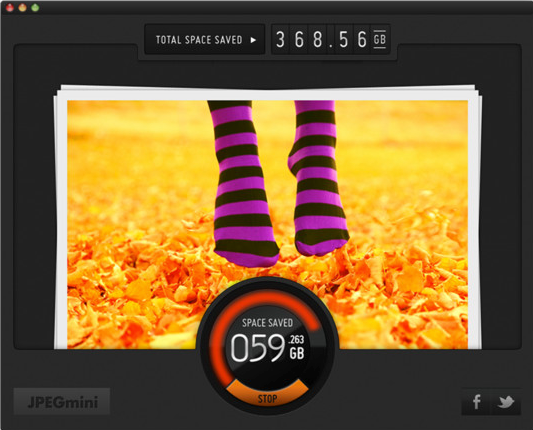 JPEGmini supports personal photos with a resolution of up to 17 Megapixels. Store up to 5x more photos in your online photo account, and upload them much faster! JPEGmini supports standard JPEG files with a resolution of up to 50 Megapixels. JPEGmini supports YCbCr and Monochrome color spaces. Other color spaces such as YCbCrK CMYK, etc. are not supported. JPEGmini currently accepts only JPEG photos as input. JPEGmini is a must have app if you love to take and collect photographs! JPEGmini is available in the Mac App Store.